(26 cm), 407 (2) pp., illustrations. Collector’s quarter-morocco binding. - Revised, second edition of Salvestrini’s bibliography (originally published as Bibliografia delle opere di Giordano Bruno, Pisa: the author, 1926), including descriptions of 93 cinquecentine. ¶ Copy 464 of 666 numbered copies. Superior copy in new condition. Offered with Sturlese (Rita), Bibliografia, censimento e storia delle antiche stampe di Giordano Bruno (Istituto Nazionale di Studi sul Rinascimento, Quaderni di `Rinascimento’, 6). Florence: Leo S. Olschki, 1987. - The author identifies some 500 owners of these texts, including many important Seicento intellectuals and bibliophiles. Publisher’s retail price €56 (www.olschki.it). ¶ Small spot on upper wrapper; otherwise a fine copy. (26 cm), 407 (3) pp., illustrations. Collector’s quarter-morocco binding. 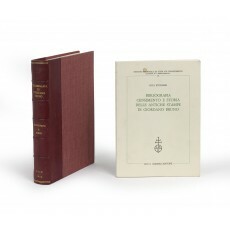 - Revised, second edition of Salvestrini’s bibliography (originally published as Bibliografia delle opere di Giordano Bruno, Pisa: the author, 1926), including descriptions of 93 cinquecentine. ¶ Copy 464 of 666 numbered copies. Superior copy in fine condition. (24 cm), xlvi, 224 (2) pp., 16 p. of plates. Publisher’s printed wrappers. 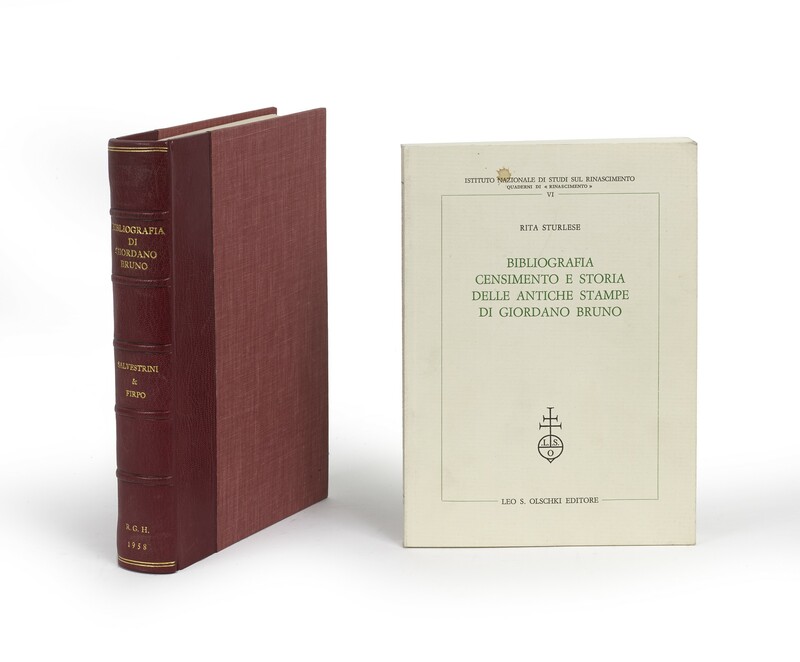 - The author identifies some 500 owners of these texts, including many important Seicento intellectuals and bibliophiles. Only copies lacking the illustrations are now available from the publisher, price €56 (“Testo mancante. Siamo spiacenti. Tranne qualche eccezione, tutti i volumi fino al 1990 non dispongono del testo illustrativo”; www.olschki.it/libro/9788822235244). ¶ Small spot on upper wrapper; otherwise a clean, unmarked copy.